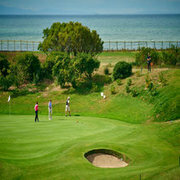 French golf holidays represent excellent quality and great value. There are many outstanding golf courses to be found, varied in style accordingly to locality, but always beautifully maintained. On top of that France has the added bonuses of excellent culture, art, fantastic cuisine and wine, history and scenery. Wedged in between the Pyrenées and the Atlantic Ocean in France’s southwesterly extremity is where you will find Biarritz, golf holidays in Biarritz have an ambience that is different from golfing in any other part of France. The stylish and vibrant town laying in the foothills of the Pyrenees, Biarritz offers a great all-year-round golfing venue with 8 superb golf courses in close proximity for players of every ability. Hilly or flat, links or woodland, with four ranked in Europe’s top 100. Along with this Biarritz offers a superb choice of restaurants and bars, michelin star to bistro, stunning wine, great seafood & Basque cuisine. 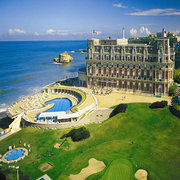 This makes Biarritz an ideal destination for your next golfing holiday. Enjoying a fantastic climate all year round, The Gironde is one of the most diverse areas in France. A golf break to Bordeaux offers everything you could possibly need. The city of Bordeaux provides you with a stunning taste of history and architecture. Situated between the Dordogne valley and the Atlantic coast in the South West of France, Bordeaux-Gironde is a most welcoming area, with its great wines, superb food and fine golf courses. Bordeaux offers a choice of 12 golf courses that are all situated at no more than 1 hours and 30 minutes away, the area where these golf courses are situated covers 4 different regions of the Gironde in total, the city of Bordeaux, the Médoc region, the Bay of Arcachon and the Dordogne valley offers rolling hills. Of course away from the golf course, Bordeaux is most famous for its world famous wines, try Bordeaux for your next golf break and you’ll find that the area has this and also so much more to offer and to discover. Growing in popularity Biarritz offers everything golf holiday makers are looking for – great courses courses in close proximity, an all year round climate and…. Enjoying a fantastic climate all year round, The Gironde is one of the most diverse areas in France. A golf break to Bordeaux offers everything ….